Firstly a word of caution - this web-page concerns only the Seaton families in the parish of Kirkmichael in Perthshire. 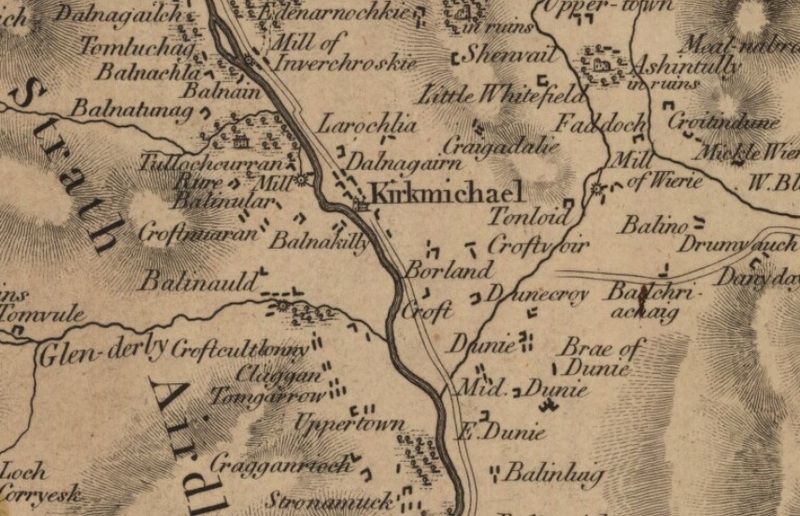 It does not include any Seatons from the parish of Kirkmichael in Kirkcudbright. "John Seaton in the parish of ..(lost).. contracted to Anne Robertson ..(lost).. Robertson of Balnak..(lost) And married ..(lost).."
Luckily the entry in the Blair Atholl OPR is undamaged. John Seaton in Nether Campsie and Ann Robertson, daughter of Bailnakeillie, in Kirkmichael parish (married). Jean 15 Feb 1763 . . Nether Campsie h.
John 5 May 1765 . . Nether Campsie h.
Thomas 19 Dec 1767 . . Nether Campsie d.
There is another Seaton marriage linked to Nether Campsie, just a few years earlier. Robert Campbell in Nether Campsie and Beatrice Seaton in Mains of Duntaulich, Dull parish, married 12 Aug 1756. Is Beatrice related to John Seaton, or is this just a coincidence? Firstly, there are no further Seaton births nor marriages linked to Nether Campsie after 1767. Secondly, Ann's father was a man of importance by being titled as 'of Balnakeillie'. He probably would have held the property in wadsett, that is as security for a large cash loan of several thousand merks, and could choose his own tenants. Thirdly, there was no establish Seaton family in Kirkmichael parish at this time to explain the appearance of Jean Seaton and John Seaton who were both 'of Kirkmichael parish' when they married in 1789 and 1794, respectively. Fourthly, Jean would have been 26 years old and John would have been 29 years old when they married, which would fit. Fifthly, there was only one other Jean Seaton living in this area of Perthshire between 1750 and 1790, and her family were living in the parish of Moulin, not Kirkmichael. Sixthly, both Jean and John had a son baptised with the name of Thomas. Once again, this is an uncommon forename for the area but Thomas was also the name of their younger brother. For all these reasons it is thought that the two Seatons who married in Kirkmichael parish are those who were born in Nether Campsie. The second Seaton record is the birth of Alexander Seton. John Seton, gardener to Baron Reid, and (Isobel) Stewart his spouse had a child baptised, called Alexander. The next Seaton record is the contract of marriage between Alexander McIntosh and Janet Seaton, 1st December 1787. The entry contains little information except that Alexander McIntosh came from Kirkmichael parish whilst Janet Seaton came from the parish of Moulin. They were married on the 12th. The only Janet Seaton of an appropriate age in Moulin parish was the daughter of James Seaton and McLagan in Loinmarstaig, who was born 26th December 1763. She would have been nearly 24 when she married. Unfortunately the couple do not seem to have had any children and nothing more is known about them, or their whereabouts, after getting married. The fourth Seaton record is the marriage contract for Jean Seton and James Small, 12th September 1789. Although it merely says that both parties were from Kirkmichael parish, as previously mention it is thought that Jean was the daughter of John Seaton and Anne Robertson in Nether Campsie. Annie 12 Dec 1790 . . . d.
John 8 Mar 1793 . . . d.
Jean 25 Jun 1796 . . . d.
Thomas 4 Sep 1798 . . . d.
The next marriage contract in Kirkmichael parish is between John Seaton and Margaret Rattray, 30th August 1794, and both were from Kirkmichael parish. Once again it is thought that John was the son of John Seaton and Anne Robertson in Nether Campsie. (un-named) 1 Sep 1795 . . . d.
James 7 Sep 1802 . . . d.
Thomas Seaton in (Cottartown?) and Elizabeth Small, there, were proclaimed three times on Sabbath 30th November 1828 in order to be married. James 8 Mar 1830 Jane Campbell 1862 Middleton h.
John 3 Jul 1832 Barbara Cameron 1867 Tomlea h.
Elizabeth Small died shortly after the birth of John, and Thomas Seaton re-married in 1835. Thomas Seaton in Balnauld and Anne Stewart in Stronamuck, both in this parish, were duly proclaimed this day in order to be married. Married the 14th of the same month. Margaret, 14th June 1837............ to be added. William, 14th May 1840............ to be added. The 1841 census lists the children from both marriages. Thomas, lawful son of Thomas Seaton, farmer in Brae of Dounie, and Anne Stewart his wife, born the 14th December 1846, baptised 7th January 1847. Daniel, lawful son of Thomas Seaton, farmer in Middle Dounie, and Anne Stewart his wife, born the 8th April, baptised 8th May 1851. Margaret 14 Jun 1837 . . . d.
Alexander 20 Mar 1842 . . . d.
Thomas 14 Dec 1846 Marion Campbell 30 Jul 1875 Loch Kennard h.
James Seaton and Jane Campbell married in 1862. John Seaton and Barbara Cameron married in 1867. On 16th August 1861 at Guay in the parish of Dowally, William Seaton, bachelor and joiner aged 21 years residing at Middle Dounie, Kirkmichael, married Ann Gow, spinster domestic servant at Guay aged 24 years. His parents were given as Thomas Seaton, deceased farmer, and Ann Stewart. Her parents were given as John Gow, blacksmith, and Grace Reid. The witnesses were Margaret Seaton and Alexander Seaton (William's siblings). William Seaton, son to William Seaton, journeyman joiner, and Ann Gow, was born at Kindrogan in the parish of Moulin, 26th April 1869. His parents were married at Dowally, 16th August 1861. Ann Gow in Moulin parish died in 1875, aged only 35 years. In 1880 William Seaton remarried, this time to Bella McKinlay in Little Dunkeld. Monument 60 in Dowally churchyard is a low marble stone carved in the shape of an open book and records that William Seaton died 19th November 1912 aged 43 years, and that aunt Margaret Gow died 15th June 1913. Grace Seaton died 28th August 1949 (aged 83 years) and Annie Seaton died 4th May 1954 (aged 90 years). On the 30th July 1875 at Wester Coshville (Coshiveil) of Grandtully, Thomas Seaton bachelor and gamekeeper at Lochtummel aged 26 years married Marion Campbell, spinster and farmer's daughter at Wester Coshville aged 19 years. His parents were given as Thomas Seaton, deceased farmer, and Anne Stewart. Her parents were given as Alexander Campbell, farmer, and Janet McPhail. The witnesses were Donald Seaton (his brother Daniel) and Grace Campbell. Another daughter, Katie, was born three years later. By 1901 John Seaton was a footman for John, Duke of Atholl, his father was butler for the Maitland family at Hazel Hall on the Perth Road, while Katie was a draper's assistant in Dunkeld. The last Kirkmichael OPR marriage which has not been dealt with already is that of Thomas Ferguson and Elspith (Elizabeth) Seaton, who was the youngest daughter of James Seaton and Jean McLagan, born 2nd October 1776. And the last Kirkmichael OPR birth which has not been dealt with already in that of Isabell, illegitimate daughter of John Seaton, Cottartown of Straloch, parish of Moulin and Margaret Shaw, here, born the 24th and baptised the 31st of October 1843. The 1841 census for Cottartown of Straloch shows that John Seaton was an agricultural labourer working for Robert Farquharson who was the tenant farmer. John's age is given as 20 but as the 1841 census tended to round the ages down to the nearest 5 or 10, then he could have been anything from 20 to 25 years old.